Chemical compounds and gases are invisible to the naked eye. Yet many companies work intensively with these substances before, during and after their production processes. The FLIR Gas Detection cameras are infrared cameras which are able to visualize gas by utilizing the physics of fugitive gas leaks. The camera produces a full picture of the scanned area and leaks appear as smoke on the camera's view finder or LCD, allowing the user to see fugitive gas emissions. 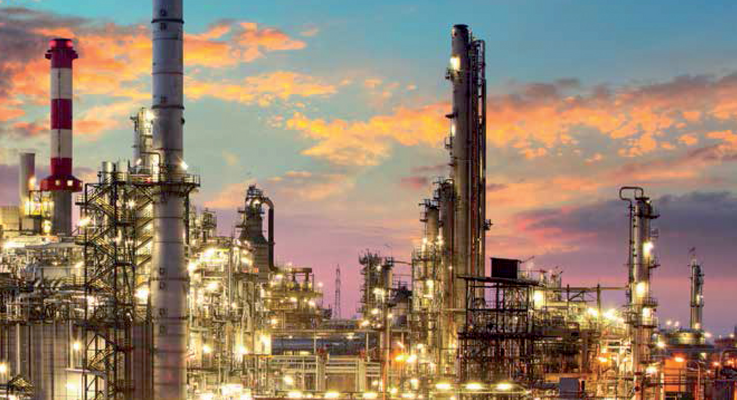 The petrochemical industry produces hydrocarbon and other substances using base feed stocks from the oil refining companies either by conversion processes or further separation that is not normally carried out at an oil refinery. Most of the chemicals used or made in these industries have good visibility using the mid wave gas detection camera. The chemical industry produces non-hydrocarbonor inorganic chemicals from base feedstocks. These are often a mixture o fbatch and continuous processes that yield very high purity products. The mid wave gas detection camera has a good response to a lot of chemicals found in this sector. The key success factors of opticalgas imaging cameras for businessesare safety, efficiency and profitability.A gas detection camera is a quick,non-contact measuring instrumentthat can be used in hard-to-accesslocations. It can detect small leaksfrom several meters away and bigleaks from hundreds of meters away.This way, operators do not need toapproach the leak from close by, whichimproves the safety significantly. Working with sniffers or probes canbe very time-consuming and a lot of the time spent inspecting installationsthat are safe and leak-free is wasted.Using a Gas Detection camera you geta complete picture and can immediatelyexclude areas that do not needany action. This saves a lot of timeand personnel. With a gas detectioncamera, measurements can be carriedout remotely and rapidly and - mostimportant of all - problems can beidentified at an early stage. Optical gas imaging allows the industryto comply with new industrialemissions regulations & proceduresas set by the new IED (IndustrialEmissions Directive) within the EUas part of the BREF (Best AvailableTechnique Reference) for Refiningor Mineral Oil & Gas. Chapter 5.1.4is the draft BREF conclusion, for theRefining or Mineral Oil and Gas industrysector, stating optical gas imagingis one of three BAT (Best AvailableTechniques) which must be used formonitoring diffuse VOC emissions. Although the cost of optical gasimaging cameras has decreasedin recent years, purchasing a gasdetection camera is still a significantinvestment for a lot of companies.According to Frank Zahorszki, CEO ofItema GmbH, a German service companyspecializedin thermographicinspections, the purchase price of anoptical gas imaging camera shouldnot deter smaller chemical companiesfrom making use of this technology. "Today, more and more companiesare contracting outside service providersfor leak detection and repair tospecialized service companies", saysZahorszki. "This begs the question whether your company should buy orloan an optical gas imaging camera. "The two main reasons for a plantbuying an OGI camera are theamount of targets to inspect and thejust-in-time availability of the camerain case of a leak. Companies thatonly require one to five inspectiondays per year, or companies that havethe convenience to wait for a servicecompany to come over, will opt foran external contractor. Very often,companies need to monitor differenttypes of gases with different types ofcameras, which justifies an externalservice provider even more.The gas detection camera techniquehas a wide range of potential usesin the chemical and petro-chemicalindustries. 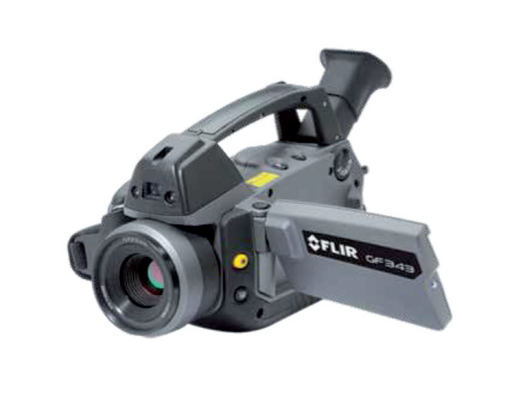 Optical gas imaging cameras likethe FLIR GF320 help to spot leaks inpiping, flanges and connections in petrochemicaloperations. The GF320 canrapidly scan large areas and pinpointleaks and is ideal for monitoring plantsthat are difficult to reach with contactmeasurement tools. Literally thousandsof components can be scannedper shift without the need to interruptthe process. It reduces repair downtimeand provides verification of theprocess. Above all it is exceptionallysafe, allowing potentially dangerousleaks (e.g. methane) to be monitoredfrom several meters away. Optical gas imaging cameras are anefficient way to inspect the workplacefor dangerous gas leaks. Thiscan especially be useful in foundriesor in other processes where significantamounts of carbon monoxide(CO) are generated. CO is a colorless,odorless gas usually formed duringthe combustion process. Anywherethere is a heated process leadingto the formation of smoke such asmoulds and cupola furnaces CO willbe present. Workers on chargingplatforms or catwalks can unknowinglybreathe high concentrationsof this gas. This can block oxygenbeing transported, from the lungs,causing the worker to suddenly loseconsciousness. High concentrationsmay prove rapidly fatal without anywarning symptoms. The FLIR GF309 is designed forhigh temperature industrial furnaceapplications. These cameras are ideal for monitoring all types of furnaces,heaters and boilers, particularly in thechemical and petrochemical industries.Custom-built to see throughflames, the FLIR GF309 also featuresa detachable heat shield designed toreflect heat away from the cameraand camera operator, providingincreased protection. Carbon dioxide (CO2) is consideredto be a relatively inexpensive tracergas for tightness testing. The methodis also reliable, can be used to testcomplex equipment, and CO2 is easyto obtain. With optical gas imagingcameras, like the FLIR GF343, youcan see CO2 leaks quickly, easily, andfrom a safe distance. This is very helpfulat turnarounds and shut-downs totest the inertization and filling of theequipment. Cracking is a conversion processused in petroleum refineries whichconverts the high-boiling, high-molecularweight hydrocarbon fractionsof petroleum crude oils to morevaluable gasoline olefinic gases andother products. Gases escaping fromthe cracking process can be highlyflammable and dangerous. Being anon-contact measurement device,OGI cameras like the FLIR GF306 areideal for monitoring chemical plant processareas/operations, such as steamcrackers and reformers, especially forcomponents that are difficult to reachwith contact measurement tools. FLIR gas imaging cameras are surprisinglysensitive, so they can beused to detect even smaller gas leaksfrom about several meters away. Thisis especially the case when operationin the High Sensitivity Mode (HSM).This is a special feature included inall GF-Series optical gas imaging cameras.It is an image subtraction videoprocessing technique that effectivelyenhances the thermal sensitivity of thecamera. The HSM feature subtracts apercentage of individual pixel signalsfrom frames in the video stream fromthe subsequent frames, thus enhancingthe differences between frames,which make leaks stand out moreclearly in the resulting images.